An old man wearing a brown robe is found wandering disoriented in the Arizona desert. He is miles from any human habitation and has no memory of how he got to be there, or who he is. The only clue to his identity is the plan of a medieval monastery in his pocket. So begins the mystery of Timeline, a story that will catapult a group of young scientists back to the Middle Ages and into the heart of the Hundred Years' War. 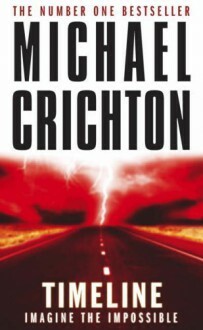 Timeline cements Michael Crichton's place as the king of the high-concept thriller, and a master storyteller to boot. That turned out to be a way better option to experience this book because there is a scene where Gerard Butler takes his shirt off. Much more enjoyable than trying to listen to this audiobook.